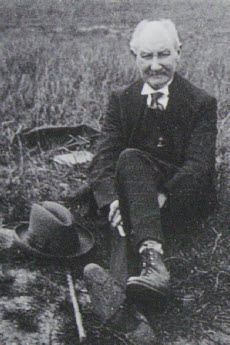 James John Pafford Mills was born within yards of the sea at Portsmouth Point on 14 March 1852. His parents, James John (a seaman rigger) and Harriett (nee Lemmon) were both from seafaring families and had married seventeen days earlier. He was brought up amid the sights and smells of the infamous slum of East Street, Old Portsmouth surrounded by his close family. Across the short stretch of water of the Camber Docks was Portsmouth Dockyard and here, as a teenager, James began a seven-year-long apprenticeship to qualify as a skilled shipwright. 1871 found him at the home of his grandparents, James and Mary Mills, at Inner Camber Quay - his own parents’ house was packed with his three brothers, his sister, Harriet, and his maternal grandparents. Meanwhile, the Tuck family was slowly meandering from Norfolk to Portsmouth via a short sojourn in London. Jeremiah James Wright Tuck had also been a seaman (like his father). 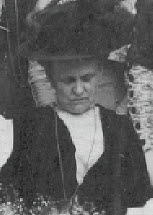 His daughter, Rosina Amelia Wright Tuck, was born in Southwark, south London in the summer of 1857 and baptised at St Mary’s, Lambeth on 21 February 1858. The Tucks were in Portsmouth by the mid-1860s and in 1871 were living at 3 Chapel Row, just three doors from the main Portsmouth Dockyard Gates. Do we sense that a meeting of two young people is about to happen? James and Rose (aged eighteen) married on Christmas Day, 1877 at Portsmouth Parish Church. Rose was following a trend set by her sister, Maria Ann Maria, who had also married a shipwright (William Bartlett) four years earlier. William and Maria Bartlett were witnesses at the Mills wedding. The newly-married couple dropped anchor at 7 Waterloo Street, Southsea (cost £200c) which was part of a newly-built housing project designed for Dockyard artisans. There, in the late spring of 1879, the first of three sons, James William, was born, quickly followed by Charles Henry (19 July 1880) and Archibald John in late 1882. 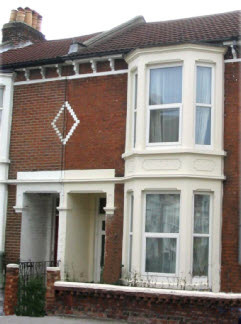 The family was living at 7 Great Southsea Street in 1891 (with Rose’s brother, William Tuck, as a lodger) and had moved again ten years later to 51 Lawrence Road, Southsea (right). There is a decorative brick that announces that this terrace was built in 1894, so James and Rose were probably the first owners of the house. This was their last move and their five-roomed house represented a gradual improvement in the quality of their home. Now, the spotlight turns upon their eldest son, James William. He was not at the family home in 1901. My mother remembered his full name and that he was ‘encouraged to leave’ home because he was an epileptic. He was known as ‘Boy’, which, to me, seems possibly a little disparaging. She remembered that he lived in Romsey and that he married someone with the surname ‘Herring’. All of which seems to suggest that there was some contact for several years between the families. While trying to trace him in the census of 1901, I found a James W. Mills aged 22, born in Southsea and boarding at 9 Mitchell Street, Melcombe Regis, Dorset. The clinching proof that this is my great-uncle is that his occupation was given as ‘barber’s assistant’. With no prompting, my uncle, Patrick, said that James was a hairdresser. In 1911, James was still single and boarding at 26 Bell Street, Romsey’. To balance the apparent mistreatment of their eldest son, James and Rose (pictured disapproving, above) showed great kindness to the young boy shown with them in the photograph at the top of the page. His name is Fred Woodnutt. 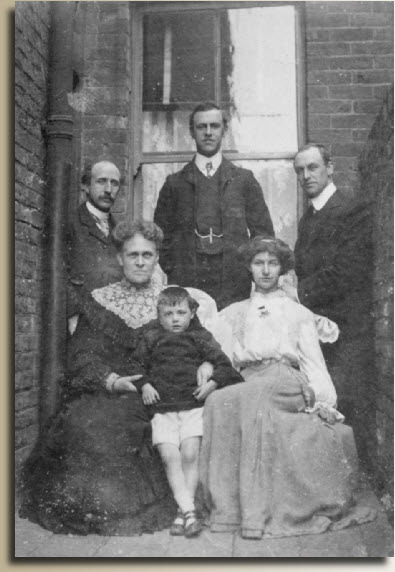 My mother recalled that he was an ‘adopted’ son of James and Rose and that he later married and moved to London. I have discovered that Fred was actually the son of James’ sister, Harriet Mills, who married George Woodnutt. Fred was born towards the end of 1901 and Harriet died the following summer. It appears that James and Rose generously took him into their family shortly afterwards. I later discovered that James married Catherine J Mackrell (not Herring - a perfect example of my mother’s uncanny ability to muddle names!) at Romsey in the March Qtr of 1913. The couple had no children. Meanwhile, and perhaps in contrast to James William, James and Rose were becoming more and more proud of Charles and Archibald who were forging promising careers in teaching. Charles attended Hartley University College at Southampton and achieved a first class degree. In 1909, he married a fellow student who was the daughter of a prominent London business man and councillor. Of the Mills family, only Rose and Archibald attended the wedding. James detested travel. Rose (who had to be persuaded to attend) looks distinctly uneasy (see above right) in the wedding photograph: evidently conscious of the social divide between herself and her in-laws. After seeing Charles return unharmed from World War I and continue teaching and Archibald appointed as headmaster of the Beneficial School, Portsmouth, Rose died from leukaemia on 17 April 1922 at the relatively young age of 64. She was buried at Highland Road Cemetery, Southsea. Her grandson remembers her as being very kind, quick-tempered and blunt. She rarely smiled. She was ‘manly’ and adventurous even ‘going up in an aeroplane’ shortly before her death. She undoubtedly ‘wore the trousers’ in her household and her husband was subservient to her. After her death, James moved across the road to 64 Lawrence Road and lived with his son, Archibald and his wife, Nellie. He visited Charles and his family every fortnight. 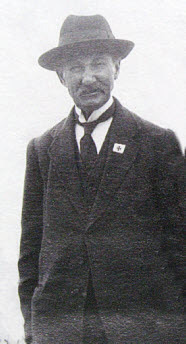 James died, aged 84, on 19 November 1936 at St Mary’s Hospital, Portsmouth and was buried near his wife. He died intestate and left an estate worth £363 8s 2d. A grandson recalls that he was, ‘a small man, deaf and totally bald with clenched hands which were malformed’ (presumably from his shipwright work). He was ‘lackadaisical and ran to work in the Dockyard - if he was late, he wasn’t allowed in’. Portsmouth Dockyard had a workforce of four thousand in 1870. Among its elite hierarchy were the skilled shipwrights who made up around a third of the workers. They were apprentice-trained and sufficiently adaptable to work on metal shipping as shipbuilding evolved from the wooden hulls of yesteryear. In the final analysis, not only sailors’ lives, but Britian’s survival depended on the quality of the work of shipwrights. Because of this mindset, the pace of their work was ‘measured’ or ‘steady’ – some even said lazy or slothful. Shipwrights were divided between the ‘hired’ and the ‘established’ men. The quota of ‘established’ men in the dockyard was fixed annually by Parliament’s Naval Estimates. Their numbers fluctuated, reflecting whether or not war was imminent. ‘Hired’ men hopefully waited their turn to become ‘established’. They then had a slightly higher rate of pay and could look forward to a pension. This was collected by retired wrights and was a visible reminder of the benefits which awaited the current ‘established men’ later in life. Established shipwrights were also guaranteed work no matter whether any emergencies looked, or not. Few shipwrights were therefore to be found in the workhouse. They also enjoyed paid holidays, paid sick leave and free medical attention. An incident in around 1 October 1909, and its repercussions, provides us with a detailed insight into James’ career. He was working on board HMS Neptune (shown below), a dreadnought battleship which was laid down in January 1909 and launched on 30 September of that year. She was to be the flagship of the Home Fleet from May 1911 until May 1912. He was employed again from 20 December 1880 until 28 January 1899. Then, he was elevated to being an ‘established’ shipwright from 29 January 1897 until he retired on 15 March 1912 – a little more than fifteen years. His weekly wages were between £1 12s 6d and £1 13 s 0d until he had a pay rise to £1 14s 0d on 1 October 1906. James later declared, ‘I can honestly say that the thirty years I laboured in HM Dockyard were used with a keen sense of duty’. His manager went on record as saying that James ‘discharged his duties with diligence and fidelity and to my satisfaction’. He was recommended for the Imperial Service medal. Despite James’ accident in 1909, between 1903 and 1912, he had not been absent from work for a period longer than twelve days. His total annual pension was a little less than £119 – the loss of his 3/6d weekly allowance mentioned earlier, represented a reduction of almost 20%. No wonder he wrote that this money was, ‘essential to me in the maintenance of my wife and family and its reduction would entail a hardship’. In 1917, his earnings from his temporary private work were £3 10s 0d a week. One further point of interest is that James signed himself James John Pafford Mills (as shown below). This indicates his awareness of his family background and desire to acknowledge the Pafford name. Of, course he knew his grandfather, James Pafford/Mills, who died when he was twenty-seven years old. If these dates are accurate, Neptune was floating in Portsmouth Harbour – which may account for James’ accident. He was working on bulkhead stiffeners in the ship’s bunkers when he fell on the edge of a plate and broke two ribs on his left side. This injury was to plague him – although the ribs healed and there was no damage to his lungs, he was unable to lift heavy weights. Almost four years after his fall, he still suffered with ‘intercostal neuralgia’ on his left side. As a result of this permanent injury incurred at work, James was awarded an extra allowance of 3/6d a week. However, in 1917, this was suspended as he came out of retirement due to ‘the present stress’ (ie WW1!) and was working. He appealed against this decision and this was upheld because the allowance was small and the permanence of his injury. Details of his appeal can be found at The National Archives and they include a potted history of his work in the Dockyard. Remember that James and Rose married on Xmas Day 1877. Then, he began work as a ‘hired’ man on 18 February 1878 when he was 25 years old. There appears to be gap in his employment record. He was born on 14 March 1852. He likely became apprenticed when he was fourteen years old in 1866 and his apprenticeship lasted seven years – or until 1873 (in the 1871 census, he was described as a ‘Dockyard Apprentice’). If he started working as a ‘hired man’ in 1878, what was his occupation between 1873 and 1878 – or did James start his apprenticeship late? He was later to say that he worked in the dockyard for thirty years – which may imply that he was not in the yard before he began work as a ‘hired’ man. James was earning between £1 7s 0d and £1 10s 0d a week. But he was laid off on 7 September 1878 for more than two years until 20 December 1880. This must have been a worrying time for the newly-married James and Rose. There was the mortgage to pay on their house which cost £200; their first son was born in the late Spring of 1879 and my grandfather was born on 19 July 1880, when James was still not a ‘hired’ shipwright. Did he find alternative work as a labourer in the Dockyard?